July 01, 2016, Paramus, NJ — The Armenian Apostolic Church monastery is a historic community site where children visit and families picnic. This beautiful monastery was built on land that was previously a 10th century fortress and coppers mine. The main church of this monastery was built at the end of the 12th century and rebuilt during the 13th and 18th century. During the 13th century, mining on this land was active. The contamination began many years ago while mining and is still present in the monastery yard today. In Armenia, the Armenian Apostolic Church monastery has one of highest levels of toxic pollution and lead poisoning. The kids of Akhtala visiting the Armenian Apostolic Church monastery. In 2012, Pure Earth conducted an independent assessment studying the soil in Armenia. There were 23 contaminated sites found, threatening the health of many Armenians. Pure Earth decided to begin with cleaning the soil in Akhtala because it had the highest levels of lead contamination. The soil lead concentrations were documented to be 47,000 mg/kb, which was more than 100 times the United States clean up standard of 400 mg/kb. Thus making 84% of approximately 500 local children at risk of lead poisoning. Lead poisoning in a child can lead to numerous health issues, which include mental disabilities and developmental delays, decreased bone and muscle growth, damage to the nervous system, kidneys and hearing. This is why Armenia Fund USA Eastern Region Affiliate is joining forces with Pure Earth, a world leader in the assessment and remediation of toxic sites. Armenia Fund’s commitment to helping Armenian communities and its success with raising private resources, along with Pure Earth’s cost-effective solutions will allow us to create a healthy future for Armenian children. Planting grass on top of the clean soil. Cleaning the contaminated soil is the initial stage of providing help to Akhtala. The second stage is to help those who have already been negatively impacted by the soil. Up to 300 children will have their blood tested for lead concentrations. Those who have elevated lead levels will be treated both physically and mentally. Counseling will be available to children who are affected, as well as to their families. There will also be workshops for everyone within the community to educate them on the dangers of lead poisoning. On behalf of the Board of Armenia Fund USA, Executive Director Lisa Stepanian invited a dedicated group of women to volunteer their time and effort to create awareness and raise funds for a pure Armenia. This group includes Pure Earth Board Member Diana Mkhitarian, Hilda Hartounian, Katia Buchakjian, Nayda Voskerijian and Tanya Bukucuyan. Armenia Fund USA Eastern Region Affiliate is dedicated to raising $100,000 to help remediate the toxic soil, conduct blood lead tests, and treat those with existing high levels of lead. A gift of $100 can fund 5 children to get tested for elevated lead levels. $500 can help pay for the trucks that will transport clean soil. $1,000 can sponsor a community workshop that will educate and counsel families in Akhtala. We would like to thank those who have donated towards this important project. To date, we have raised $15,000 as a result of your support. There is still a long way to go to reach our goal, but we are headed in the right direction. This project is scheduled to commence in spring of 2017. 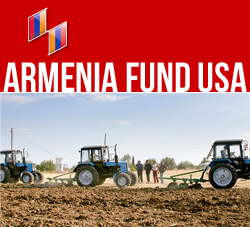 Armenia Fund USA cannot think of a more important project to help support. United we are on the way of positively changing the lives of many. Please call our office at 201-639-3985 if you have questions or considerations about this project or would like to make a donation.